Sharkwater is definitely one of the most powerful documentaries that I have seen in quite some time as filmmaker Rob Stewart takes us on a personal journey to save one of the most endangered species on the planet, the shark. Since a boy, Stewart has had a passion for sharks that led to become an underwater photographer and advocate for sharks, as mankind hunts this noble underwater predator to extinction. Throughout the documentary, Stewart clever dispels many of the shark myths that these are mindless predators and attack only to fulfill some primeval hunger, rather sharks are quite intelligent creatures and are a vital part of the underwater food chain. At times, some of these myths and strategies towards sharks are quite laughable such as the 1960's American Air Force film to assist fallen airmen into the ocean. One of these strategies involve shouting into the water to scare away sharks with the commentator making a bold statement to remember, humans are smarter than sharks. On average, only 5 people die per year world wide from shark attacks, whereas Elephants and Tigers kill around 100 people year. Unfortunately the "fear" of sharks causes many to shudder. 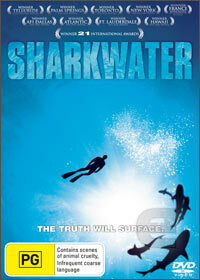 Sharkwater is also filmed in high definition video which looks amazing and is complimented with vibrant colours and extremely sharp picture quality. At times, it's like you are actually part of this underwater wonder world and it assists in transferring Stewart's passion when you see how cruel man can be towards these ancient predators. Stewart takes viewers to the one of the world's last great shark populations in the marine reserves of the Cocos Islands, Costa Rica and the Galapagos Islands, Ecuador. Joining forces with renegade conservationist Paul Watson of the Sea Shepherd Conservation Society, together they attempt to uncover the corruptions within these government as they illegally line fish for sharks in order to collect shark fins. As the documentary progresses, we learn that the Taiwanese mafia are involved in one of the biggest political corruption scandals in Costa Rica where millions of sharks have been killed for their fins. What is even more disturbing that once these sharks are captured, they cut their fins and throw their bodies back into the ocean. The documentary is quite daring at times as the Sea Shepherd rams an illegal fishing boat, with the crew only to be arrested by the Costa Rican authorities. Rather than face their unfair judicial system, they make a mad dash to international waters, only to be chased by the coast guard. Acts like this, only showcases the passion behind these amazing people and their fight for one of the most endangered species on the planet. It's a gripping documentary from start to finish that actually overturned the governments decision to allow line fishing with the Galapagos Islands due to public outrage. There was never a dull moment within this documentary that had me glued to the screen for the entire length. I would recommend this documentary to everyone and hopefully one day, these ancient predators will be a protected species worldwide.